This article is about the American industrialist. For other uses, see Henry Ford (disambiguation). Although Ford invented neither the automobile nor the assembly line, he developed and manufactured the first automobile that many middle class Americans could afford. In doing so, Ford converted the automobile from an expensive curiosity into a practical conveyance that would profoundly impact the landscape of the 20th Century. His introduction of the Model T automobile revolutionized transportation and American industry. As the owner of the Ford Motor Company, he became one of the richest and best-known people in the world. He is credited with "Fordism": mass production of inexpensive goods coupled with high wages for workers. Ford had a global vision, with consumerism as the key to peace. His intense commitment to systematically lowering costs resulted in many technical and business innovations, including a franchise system that put dealerships throughout most of North America and in major cities on six continents. Ford left most of his vast wealth to the Ford Foundation and arranged for his family to control the company permanently. Ford was also widely known for his pacifism during the first years of World War I, and for promoting antisemitism through his newspaper The Dearborn Independent and the book The International Jew. Henry Ford was born July 30, 1863, on a farm in Greenfield Township, Michigan. His father, William Ford (1826–1905), was born in County Cork, Ireland, to a family that was originally from Somerset, England, His mother, Mary Ford (née Litogot; 1839–1876), was born in Michigan as the youngest child of Belgian immigrants; her parents died when she was a child and she was adopted by neighbors, the O'Herns. Henry Ford's siblings were Margaret Ford (1867–1938); Jane Ford (c. 1868–1945); William Ford (1871–1917) and Robert Ford (1873–1934). Ford married Clara Jane Bryant (1866–1950) on April 11, 1888 and supported himself by farming and running a sawmill. They had one child: Edsel Ford (1893–1943). In 1891, Ford became an engineer with the Edison Illuminating Company. After his promotion to Chief Engineer in 1893, he had enough time and money to devote attention to his personal experiments on gasoline engines. These experiments culminated in 1896 with the completion of a self-propelled vehicle which he named the Ford Quadricycle. He test-drove it on June 4. After various test drives, Ford brainstormed ways to improve the Quadricycle. The Model T was introduced on October 1, 1908. It had the steering wheel on the left, which every other company soon copied. The entire engine and transmission were enclosed; the four cylinders were cast in a solid block; the suspension used two semi-elliptic springs. The car was very simple to drive, and easy and cheap to repair. It was so cheap at $825 in 1908 ($21,760 today) (the price fell every year) that by the 1920s, a majority of American drivers had learned to drive on the Model T.
By 1918, half of all cars in America were Model T's. All new cars were black; as Ford wrote in his autobiography, "Any customer can have a car painted any color that he wants so long as it is black". Until the development of the assembly line, which mandated black because of its quicker drying time, Model Ts were available in other colors, including red. The design was fervently promoted and defended by Ford, and production continued as late as 1927; the final total production was 15,007,034. This record stood for the next 45 years. This record was achieved in 19 years from the introduction of the first Model T (1908). Henry Ford turned the presidency of Ford Motor Company over to his son Edsel Ford in December 1918. Henry retained final decision authority and sometimes reversed his son. Henry started another company, Henry Ford and Son, and made a show of taking himself and his best employees to the new company; the goal was to scare the remaining holdout stockholders of the Ford Motor Company to sell their stakes to him before they lost most of their value. (He was determined to have full control over strategic decisions.) The ruse worked, and Henry and Edsel purchased all remaining stock from the other investors, thus giving the family sole ownership of the company. By 1926, flagging sales of the Model T finally convinced Henry to make a new model. He pursued the project with a great deal of technical expertise in design of the engine, chassis, and other mechanical necessities, while leaving the body design to his son. Edsel also managed to prevail over his father's initial objections in the inclusion of a sliding-shift transmission. Ford astonished the world in 1914 by offering a $5 per day wage ($120 today), which more than doubled the rate of most of his workers. A Cleveland, Ohio newspaper editorialized that the announcement "shot like a blinding rocket through the dark clouds of the present industrial depression." The move proved extremely profitable; instead of constant turnover of employees, the best mechanics in Detroit flocked to Ford, bringing their human capital and expertise, raising productivity, and lowering training costs. Ford announced his $5-per-day program on January 5, 1914, raising the minimum daily pay from $2.34 to $5 for qualifying male workers. Detroit was already a high-wage city, but competitors were forced to raise wages or lose their best workers. Ford's policy proved, however, that paying people more would enable Ford workers to afford the cars they were producing and be good for the local economy. He viewed the increased wages as profit-sharing linked with rewarding those who were most productive and of good character. It may have been Couzens who convinced Ford to adopt the $5-day. The profit-sharing was offered to employees who had worked at the company for six months or more, and, importantly, conducted their lives in a manner of which Ford's "Social Department" approved. They frowned on heavy drinking, gambling, and (what today are called) deadbeat dads. The Social Department used 50 investigators, plus support staff, to maintain employee standards; a large percentage of workers were able to qualify for this "profit-sharing." Ford had made the decision to boost productivity, as workers were expected to put more effort into their work in exchange for more leisure time, and because he believed decent leisure time was good for business, since workers would actually have more time to purchase and consume more goods. However, altruistic concerns also played a role, with Ford explaining "It is high time to rid ourselves of the notion that leisure for workmen is either ‘lost time’ or a class privilege." Ford was adamantly against labor unions. He explained his views on unions in Chapter 18 of My Life and Work. He thought they were too heavily influenced by some leaders who, despite their ostensible good motives, would end up doing more harm than good for workers. Most wanted to restrict productivity as a means to foster employment, but Ford saw this as self-defeating because, in his view, productivity was necessary for any economic prosperity to exist. To forestall union activity, Ford promoted Harry Bennett, a former Navy boxer, to head the Service Department. Bennett employed various intimidation tactics to squash union organizing. The most famous incident, on May 26, 1937, involved Bennett's security men beating with clubs UAW representatives, including Walter Reuther. While Bennett's men were beating the UAW representatives, the supervising police chief on the scene was Carl Brooks, an alumnus of Bennett’s Service Department, and [Brooks] "did not give orders to intervene." The incident became known as The Battle of the Overpass. In the late 1930s and early 1940s, Edsel—who was president of the company—thought Ford had to come to some sort of collective bargaining agreement with the unions because the violence, work disruptions, and bitter stalemates could not go on forever. But Henry, who still had the final veto in the company on a de facto basis even if not an official one, refused to cooperate. For several years, he kept Bennett in charge of talking to the unions that were trying to organize the Ford Motor Company. Sorensen's memoir makes clear that Henry's purpose in putting Bennett in charge was to make sure no agreements were ever reached. The Ford Motor Company was the last Detroit automaker to recognize the United Auto Workers union (UAW). A sit-down strike by the UAW union in April 1941 closed the River Rouge Plant. Sorensen recounted that a distraught Henry Ford was very close to following through with a threat to break up the company rather than cooperate, but his wife Clara told him she would leave him if he destroyed the family business. In her view, it would not be worth the chaos it would create. Henry complied with his wife's ultimatum, and even agreed with her in retrospect. Overnight, the Ford Motor Company went from the most stubborn holdout among automakers to the one with the most favorable UAW contract terms. The contract was signed in June 1941. Ford opposed war, which he viewed as a terrible waste. Ford became highly critical of those who he felt financed war, and he tried to stop them. In 1915, the pacifist Rosika Schwimmer gained favor with Ford, who agreed to fund a Peace Ship to Europe, where World War I was raging. He and about 170 other prominent peace leaders traveled there. Ford's Episcopalian pastor, Reverend Samuel S. Marquis, accompanied him on the mission. Marquis headed Ford's Sociology Department from 1913 to 1921. Ford talked to President Wilson about the mission but had no government support. His group went to neutral Sweden and the Netherlands to meet with peace activists. A target of much ridicule, Ford left the ship as soon as it reached Sweden. Ford had opposed America's entry into World War II and continued to believe that international business could generate the prosperity that would head off wars. Ford "insisted that war was the product of greedy financiers who sought profit in human destruction"; in 1939 he went so far as to claim that the torpedoing of U.S. merchant ships by German submarines was the result of conspiratorial activities undertaken by financier war-makers. The financiers to whom he was referring was Ford's code for Jews; he had also accused Jews of fomenting the First World War. In the run-up to World War II and when the war erupted in 1939, he reported that he did not want to trade with belligerents. Like many other businessmen of the Great Depression era, he never liked or entirely trusted the Franklin Roosevelt Administration, and thought Roosevelt was inching the U.S. closer to war. However, Ford continued to do business with Nazi Germany, including the manufacture of war materiel. Beginning in 1940, with the requisitioning of between 100 and 200 French POWs to work as slave laborers, Ford-Werke contravened Article 31 of the 1929 Geneva Convention. At that time, which was before the U.S. entered the war and still had full diplomatic relations with Nazi Germany, Ford-Werke was under the control of the Ford Motor Company. The number of slave laborers grew as the war expanded although Wallace makes it clear that companies in Germany were not required by the Nazi authorities to use slave laborers. When Rolls-Royce sought a U.S. manufacturer as an alternative source for the Merlin engine (as fitted to Spitfire and Hurricane fighters), Ford first agreed to do so and then reneged. He "lined up behind the war effort" when the U.S. entered in late 1941. His support of the American war effort, however, was problematic. Once the U.S. entered the war, Ford directed the Ford Motor Company to construct a vast new purpose-built factory at Willow Run near Detroit, Michigan. Ford broke ground on Willow Run in the spring of 1941, and the first B-24 came off the line in October 1942. At 3,500,000 sq ft (330,000 m2), it was the largest assembly line in the world at the time. At its peak in 1944, the Willow Run plant produced 650 B-24s per month, and by 1945 Ford was completing each B-24 in eighteen hours, with one rolling off the assembly line every 58 minutes. Ford produced 9,000 B-24s at Willow Run, half of the 18,000 total B-24s produced during the war. When Edsel Ford died prematurely in 1943, Henry Ford nominally resumed control of the company, but a series of strokes in the late 1930s had left him increasingly debilitated, and his mental ability was fading. Ford was increasingly sidelined, and others made decisions in his name. The company was in fact controlled by a handful of senior executives led by Charles Sorensen, an important engineer and production executive at Ford; and Harry Bennett, the chief of Ford's Service Unit, Ford's paramilitary force that spied on, and enforced discipline upon, Ford employees. Ford grew jealous of the publicity Sorensen received and forced Sorensen out in 1944. Ford's incompetence led to discussions in Washington about how to restore the company, whether by wartime government fiat, or by instigating some sort of coup among executives and directors. Nothing happened until 1945 when, with bankruptcy a serious risk, Edsel's widow led an ouster and installed her son, Henry Ford II, as president. The young man took full control, and forced out Harry Bennett in a purge of the old guard in 1947. During this period, Ford emerged as "a respected spokesman for right-wing extremism and religious prejudice," reaching around 700,000 readers through his newspaper. The 2010 documentary film Jews and Baseball: An American Love Story (written by Pulitzer Prize winner Ira Berkow) states that Ford wrote on May 22, 1920: "If fans wish to know the trouble with American baseball they have it in three words—too much Jew." 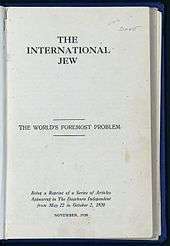 In Germany, Ford's antisemitic articles from The Dearborn Independent were issued in four volumes, cumulatively titled The International Jew, the World's Foremost Problem published by Theodor Fritsch, founder of several antisemitic parties and a member of the Reichstag. In a letter written in 1924, Heinrich Himmler described Ford as "one of our most valuable, important, and witty fighters." Ford is the only American mentioned favorably in Mein Kampf, although he is only mentioned once: Adolf Hitler wrote, "only a single great man, Ford, [who], to [the Jews'] fury, still maintains full independence...[from] the controlling masters of the producers in a nation of one hundred and twenty millions." Speaking in 1931 to a Detroit News reporter, Hitler said he regarded Ford as his "inspiration," explaining his reason for keeping Ford's life-size portrait next to his desk. Steven Watts wrote that Hitler "revered" Ford, proclaiming that "I shall do my best to put his theories into practice in Germany," and modeling the Volkswagen, the people's car, on the Model T.
However, Max Wallace has stated "History records that...Adolf Hitler was an ardent Anti-Semite before he ever read Ford's The International Jew. While Ford's articles were denounced by the Anti-Defamation League (ADL), the articles explicitly condemned pogroms and violence against Jews, but blamed the Jews for provoking incidents of mass violence. None of this work was written by Ford, but he allowed his name to be used as author. According to trial testimony, he wrote almost nothing. Friends and business associates have said they warned Ford about the contents of the Independent and that he probably never read the articles (he claimed he only read the headlines). However, court testimony in a libel suit, brought by one of the targets of the newspaper, alleged that Ford did know about the contents of the Independent in advance of publication. A libel lawsuit was brought by San Francisco lawyer and Jewish farm cooperative organizer Aaron Sapiro in response to the antisemitic remarks, and led Ford to close the Independent in December 1927. News reports at the time quoted him as saying he was shocked by the content and unaware of its nature. During the trial, the editor of Ford's "Own Page," William Cameron, testified that Ford had nothing to do with the editorials even though they were under his byline. Cameron testified at the libel trial that he never discussed the content of the pages or sent them to Ford for his approval. Investigative journalist Max Wallace noted that "whatever credibility this absurd claim may have had was soon undermined when James M. Miller, a former Dearborn Independent employee, swore under oath that Ford had told him he intended to expose Sapiro." The ADL mobilized prominent Jews and non-Jews to publicly oppose Ford's message. They formed a coalition of Jewish groups for the same purpose and raised constant objections in the Detroit press. Before leaving his presidency early in 1921, Woodrow Wilson joined other leading Americans in a statement that rebuked Ford and others for their antisemitic campaign. A boycott against Ford products by Jews and liberal Christians also had an impact, and Ford shut down the paper in 1927, recanting his views in a public letter to Sigmund Livingston, ADL. Wallace also found that Ford's apology was likely, at least partly, motivated by a business that was slumping as result of his antisemitism repelling potential buyers of Ford cars. Up until the apology, a considerable number of dealers, who had been required to make sure that buyers of Ford cars received the Independent, bought up and destroyed copies of the newspaper rather than alienate customers. In July 1938, before the outbreak of war, the German consul at Cleveland gave Ford, on his 75th birthday, the award of the Grand Cross of the German Eagle, the highest medal Nazi Germany could bestow on a foreigner. James D. Mooney, vice-president of overseas operations for General Motors, received a similar medal, the Merit Cross of the German Eagle, First Class. The decisive anti-Semitic book I was reading and the book that influenced my comrades was ... that book by Henry Ford, "The International Jew". I read it and became anti-Semitic. The book made a great influence on myself and my friends because we saw in Henry Ford the representative of success and also the representative of a progressive social policy. After signing contract for technical assistance in building Nizhny Novgorod (Gorky) Automobile Plant. Dearborn, Mich., May 31, 1929. Left to right, Valery I. Mezhlauk, Vice Chairman of VSNKh; Henry Ford; Saul G. Bron, President of Amtorg. Most of the directors did not want to see him as President. But for the previous 20 years, though he had long been without any official executive title, he had always had de facto control over the company; the board and the management had never seriously defied him, and this moment was not different. The directors elected him, and he served until the end of the war. During this period the company began to decline, losing more than $10 million a month ($136,980,000 today). The administration of President Franklin Roosevelt had been considering a government takeover of the company in order to ensure continued war production, but the idea never progressed. A compendium of short biographies of famous Freemasons, published by a Freemason lodge, lists Ford as a member. The Grand Lodge of New York confirms that Ford was a Freemason, and was raised in Palestine Lodge No. 357, Detroit, in 1894. When he received his 33rd in 1940, he said, "Masonry is the best balance wheel the United States has." He also had a vacation home (known today as the "Ford Plantation") in Richmond Hill, Georgia which is still in existence today as a private community. Henry started buying land in this area and eventually owned 70,000 acres (110 square miles) there. In 1936, Ford broke ground for a beautiful Greek revival style mansion on the banks of the Ogeechee River on the site of a 1730s plantation. The grand house, made of Savannah-gray brick, had marble steps, air conditioning, and an elevator. It sat on 55 acres of manicured lawns and flowering gardens. The house became the center of social gatherings with visitations by the Vanderbilts, Rockefellers, and the DuPonts. It remains the centerpiece of The Ford Plantation today. Ford converted the 1870s–era rice mill into his personal research laboratory and powerhouse and constructed an underground tunnel from there to the new home, providing it with steam. He contributed substantially to the community, building a chapel and schoolhouse and employing numerous local residents. Ford is treated as a character in several historical novels, notably E. L. Doctorow's Ragtime (1975), and Richard Powers' novel Three Farmers on the Way to a Dance (1985). Ford, his family, and his company were the subjects of a 1986 biography by Robert Lacey entitled Ford: The Man and the Machine. The book was adapted in 1987 into a film starring Cliff Robertson and Michael Ironside. ↑ Watts, Steven (2006). The People's Tycoon: Henry Ford and the American Century. Random House, Inc. p. 28. ↑ "Widow of Automobile Pioneer, Victim of Coronary Occlusion, Survived Him Three Years". Associated Press. September 29, 1950. Friday, Sept. 29 (Associated Press) Mrs. Clara Bryant Ford, 84 year-old widow of Henry Ford, died at 2 A. M. today in Henry Ford Hospital. A family spokesman said her death was the result of an acute coronary occlusion. ↑ "Edsel Ford Dies in Detroit at 49. Motor Company President, the Only Son of Its Founder, Had Long Been Ill.". Associated Press. May 26, 1943. Edsel Ford, 49-year-old president of the Ford Motor Company, died this morning at his home at Grosse Pointe Shores following an illness of six weeks. 1 2 3 4 5 6 7 8 9 Ford R. Bryan, "The Birth of Ford Motor Company", Henry Ford Heritage Association, retrieved August 20, 2012. ↑ Ford & Crowther 1922, p. 72. ↑ Sorensen 1956, p. 223. ↑ Using the consumer price index, this was equivalent to $111.10 per day in 2008 dollars. ↑ Ford & Crowther 1922, pp. 126–130. ↑ Ford & Crowther 1922, p. 130. ↑ Ford & Crowther 1922, p. 126. ↑ Ford & Crowther 1922, pp. 253–266. ↑ Harris, J: Henry Ford, pages 91–92. Moffa Press, 1984. 1 2 3 4 5 6 7 8 Wallace, Max. (2003). The American axis: Henry Ford, Charles Lindbergh, and the rise of the Third Reich. New York: St. Martin’s Press. ↑ Sorensen 1956, p. 261. 1 2 3 4 Sorensen 1956, pp. 266–272. ↑ Henry Ford, Biography (March 25, 1999). A&E Television. ↑ Watts (2005). The People's Tycoon. pp. 225–249. ↑ Banham, Russ. (2002) The Ford Century. Tehabi Books. ISBN 1-887656-88-X, p. 44. ↑ Watts (2005). The People's Tycoon. p. 378. ↑ Baldwin, Neil (2001). Henry Ford and the Jews: The Mass Production of Hate. New York: Public Affairs. 1 2 Nolan, Jenny. "Michigan History: Willow Run and the Arsenal of Democracy." The Detroit News, 28 January 1997. Retrieved: 7 August 2010. 1 2 Sorensen 1956, pp. 324–333. ↑ Yates, Brock. "10 Best Moguls", in Car and Driver, 1/88, p.45. ↑ Howard P. Segal (2008). 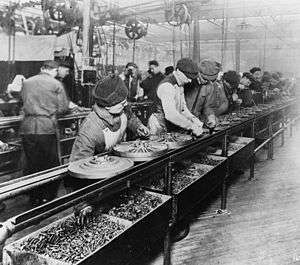 Recasting the Machine Age: Henry Ford's Village Industries. p. 46. ↑ Glock, Charles Y. and Quinley, Harold E. (1983). Anti-Semitism in America. Transaction Publishers. ISBN 0-87855-940-X, p. 168. ↑ Zeitlin, Alan (November 15, 2010). "Jews and Baseball Is A Film You Should Catch". The New York Blueprint. Archived from the original on December 10, 2010. Retrieved February 6, 2014. ↑ Allen, Michael Thad (2002). The Business of Genocide: The SS, Slave Labor, and the Concentration Camps. Chapel Hill, NC: University of North Carolina Press. pp. 14, 290. ISBN 0-8078-2677-4. See also, Pfal-Traughber, Armin (1993). Der antisemitisch-antifreimaurerische Verschwörungsmythos in der Weimarer Republik und im NS-Staat. Vienna: Braumüller. p. 39. . See also: Eliten-Antisemitismus in Nazi-Kontinuität. In: Graswurzelrevolution. December 2003. Pfal-Traughber and Allen both cite Ackermann. Heinrich Himmler als Ideologe. p. 37. 1 2 3 "Ford and GM Scrutinized for Alleged Nazi Collaboration". Washington Post. November 30, 1998. pp. A01. Retrieved March 5, 2008. ↑ Max Wallace The American Axis: Henry Ford, Charles Lindbergh, and the Rise of the Third Reich, (Macmillan, 2004), pp.50–54, ISBN 0-312-33531-8. Years later, in 1977, Winifred claimed that Ford had told her that he had helped finance Hitler. This anecdote is the suggestion that Ford made a contribution. The company has always denied that any contribution was made, and no documentary evidence has ever been found. Ibid p. 54. See also Neil Baldwin, Henry Ford and the Jews: The Mass Production of Hate, (Public Affairs, 2002), pp. 185–89, ISBN 1-58648-163-0. ↑ Ford, Henry (2003). The International Jew: The World's Foremost Problem. Kessinger Publishing. ISBN 0-7661-7829-3, p. 61. ↑ Watts pp x, 376–387; Lewis (1976) pp 135–59. ↑ Lewis, (1976) pp. 140–56; Baldwin p 220–21. ↑ Barkun, Michael (1996). Religion and the Racist Right: The Origins of the Christian Identity Movement. UNC Press. ISBN 0-8078-4638-4, p. 35. ↑ Blakeslee, Spencer (2000). The Death of American Antisemitism. Praeger/Greenwood. ISBN 0-275-96508-2, p. 83. 1 2 3 Lewis, David I. (1976). The Public Image of Henry Ford: An American Folk Hero and His Company. Wayne State University Press. ISBN 0-8143-1553-4. , pp. 146–154. ↑ Baldur von Schirach before the International Military Tribunal at Nuremberg. May 23, 1946. 1 2 "Leader in Production Founded Vast Empire in Motors in 1903. He had Retired in 1945. Began Company With Capital of $28,000 Invested by His Friends and Neighbors. Henry Ford Is Dead. Founder of Vast Automotive Empire and Leader in Mass Production.". Associated Press. April 8, 1947. 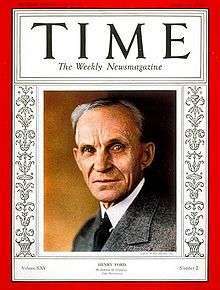 Henry Ford, noted automotive pioneer, died at 11:40 tonight at the age of 83. He had retired a little more than a year and a half ago from active direction of the great industrial empire he founded in 1903. ↑ Melnikova-Raich, Sonia (2011). "The Soviet Problem with Two 'Unknowns': How an American Architect and a Soviet Negotiator Jump-Started the Industrialization of Russia, Part II: Saul Bron". IA, The Journal of the Society for Industrial Archeology. 37 (1/2): 5–28. ISSN 0160-1040. JSTOR 23757906. ↑ Austin, Richard Cartwright (2004). Building Utopia: Erecting Russia's First Modern City, 1930. Kent State University Press. ISBN 9781612773216. OCLC 819325601. ↑ Agreement Between the Ford Motor Company, the Supreme Council of National Economy, and the Amtorg Trading Corporation, 31 May 1929, Amtorg Records 1929–1930, Acc. 199, box 1a, Benson Ford Research Center, The Henry Ford, Dearborn, Mich.
↑ The New York Times, 5 and 7 May 1929. ↑ Ford & Crowther 1922, pp. 242–244. ↑ Ford & Crowther 1922, p. 50. ↑ Sorensen 1956, pp. 325–26. ↑ Don Lochbeiler (July 22, 1997). "'I think Mr. Ford is Leaving Us'". The Detroit News Michigan History. detnews.com. Retrieved October 29, 2010. ↑ Denslow 2004, p. 62. ↑ Marquis, Samuel S. (/2007). Henry Ford: An Interpretation. Wayne State University Press. ↑ Ford 1922, pp. 18,65–67. 1 2 Ford 1922, p. 281. ↑ Ford 1922, pp. 275–276. ↑ Seibert, David. "Henry Ford at Richmond Hill". GeorgiaInfo: an Online Georgia Almanac. Digital Library of Georgia. Retrieved 7 November 2016. ↑ Wallace, Max. The American Axis: Henry Ford, Charles Lindbergh, and the Rise of the Third Reich. New York: St. Martin's Press. ↑ "Ten pioneers are named to automotive Hall of Fame". Toledo Blade. Toledo, Ohio. May 1, 1946. p. 10. Retrieved March 5, 2016. ↑ "Henry Ford". Hall of Fame Inductees. Automotive Hall of Fame. 1946. Retrieved March 5, 2016. Ford, Henry; Crowther, Samuel (1926). "Today and Tomorrow". Garden City, New York, USA: Doubleday, Page & Company. Co-edition, 1926, London, William Heinemann. Various republications, including ISBN 0-915299-36-4. Ford, Henry; Crowther, Samuel (1930). "Moving Forward". Garden City, New York, USA: Doubleday, Doran & Company, Inc. Co-edition, 1931, London, William Heinemann. Pool, James; Pool, Suzanne (1978), ""Chapter: Ford and Hitler"", Who Financed Hitler: The Secret Funding of Hitler's Rise to Power, 1919-1933, Dial Press, ISBN 978-0708817568.